Tired of chemis-trying? Need to get those grades skyrocketing? Fret not, you’ve found the best chemistry tutor that you’ve been looking for! Join hundreds of students who got As with their A-Level Chemistry and got into their dream universities. 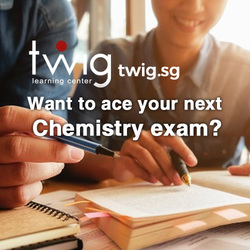 Our Twig™ method of learning is a surefire way to ace A-Level Chemistry in just less than 6 months. Drop us a call at +65 97486339 or email us at twiglearningcenter@gmail.com today. You may also visit our website at httptwig.sg for more information or head over to our location at 177B Thomson Road, Goldhill Centre Singapore 307625.